At the cottage you will enjoy the comfort of a 550 square foot house nestled on our 12 acre Hill Country Retreat. The cottage offers a king size bed, full kitchen, satellite with 26' flat screen TV, WI-FI, private hot tub, gas grill, and large back deck complete with a hammock. This cottage is flush with architectural details. 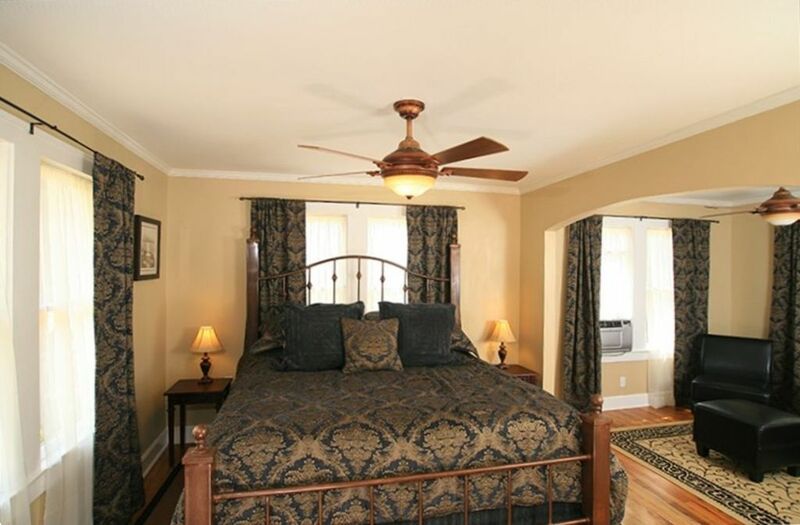 Warm refinished hardwood floors spread throughout the cottage. All interior doors are original, complete with crystal door knobs, pewter hinges and locks. The bathroom contains a pedestal sink and completely retiled shower accented with slate and glass tile. The kitchen is outfitted with electric range and cook top, microwave, coffee maker, refrigerator and cupboards stocked with pots, pans and all necessary utensils. The cabinet doors are punctuated with Flemish glass and the back splash and bar are accented with slate tile. We are located close to a variety of activities and attractions in the Texas Hill Country and conveniently located to several of the area’s finest day-trip destinations including Wimberley, Gruene and Boerne. During your stay, you are within easy reach of a number of both wineries and breweries, Market Days, golf courses, shopping, and the numerous water sport and recreation possibilities provided by Canyon Lake and the surrounding Guadalupe and Comal Rivers. Live music is waiting for you just down the road at the new Whitewater Amphitheater! This is the perfect place for a romantic escape for two. Come visit Canyon Lake in style. Come stay at the Montview Cottage. We welcome you to our Montview Cottages. The cottage offers privacy and seclusion. You will enjoy your own hot tub, deck and gas grill. You can't help but relax when you are here. We added the Montview Cottage to the 12 Acres already occupied by the Cedar Cabin Retreat. This cottage was originally located in Austin and was saved from demolition and transported to Canyon Lake the summer of 2007. The cottage offers privacy and seclusion. You will enjoy your own hot tub, deck and gas grill. You can't help but relax when you are here. Need internet? No problem. There is WIFI throughout the property. Need TV? No problem. The cottage comes with satellite TV. The property is surrounded by tree covered hills. Medium sized refrigerator. Can easily hold a weeks worth of food. The freezer is on top. Two person seating at kitchen bar. Medium sized patio dining set outside on the deck. Stereo with iPhone dock and auxiliary port. Private hot tub surrounded by privacy fence and landscaping. Very Private. We had a great time. House was as listed. Very private and all the amenities we needed. Great location away from traffic but close enough to easily get to town for dinner or shopping. Property was nice and hot tub and hammock were great for relaxing. Looking forward to returning again. My husband and I booked this place for a last minute weekend trip. The cottage is a perfect size for 2. The bed was comfortable and we appreciated the WiFi access. The weekend turned out to be cold and rainy so we didn’t really leave the cottage. The hut tub was so nice to just sit and relax and the kitchen was well equipped to cook all of our meals. The area was quiet and felt secluded! It was a wonderful, romantic weekend getaway! Would definitely recommend! We hope to come back when the weather is better so that we can explore the area more. My wife and I loved our time at the Mountview Cottege. The property was well maintained and stocked with plenty of the basics all you need to do is stop for groceries. The only thing I would change is the couch in the living room, other than that this was an awesome small house. Thanks for sharing your property with us. Wonderful place to get away for a few days. We enjoyed our stay very very much. Justin is the ultimate host and went above and beyond to help us with a few special needs. Everything was nice and clean, comfortable and felt very "homey". We will definitely plan on staying there again in the future. My wife and I rented the Montview Cottage for a weekend escape from the kids and dogs. This was the perfect mini vacation, and centrally located allowing great access to Gruene Hall, Whitewater Amphitheater, and Wimberly. The Cottage is just perfect, very clean and well kept up. We lounged on the back porch and were even visited by a curious doe. We would highly recommend this cottage, and we plan to return and try some of the other cabins/cottages on the property. Canyon Lake is minutes away by car. The Guadalupe river is 10 minutes away by car. Whitewater Amphitheater is 10 minutes away.